This book is a little quirky with a strange sense of humour. While we enjoyed parts of the story; in particular, Agatha Pantha’s Chair of Discernment, on the whole we found it hard to engage in it fully. We found it hard to believe in the characters. While this was a nice and easy ready, that we think would make a good holiday read, we found the ending just left us with too many questions. 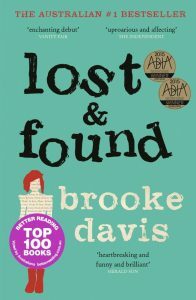 This entry was posted in Australian Authors, Book Club Kits, Book Reviews, Fiction, Staff Favourites, What staff have been reading and tagged Book Club Kit, Brooke Davis, Lost & Found by admin. Bookmark the permalink.